This week, Google Shopping Partnerships Executives Puja Chokshi and Anand Vora shared how changes in consumer shopping behavior have impacted the search giant’s strategy and the implications for future of online shopping – especially for consumer packaged goods. It’s more important than ever for CPG brands to build a sales strategy that is responsive to what customers are searching for, instead of relying on mass market messages that tell them what to buy. Listen now to How to Build Your Brand and Your Business with Google Shopping. 1. Search is going to get smarter. Google is increasingly investing in its AI-enabled products to improve on its Google Assistant offering. Google Assistant is meant to be a tool that helps every consumer with their daily lives, like getting news, knowing what to cook, where to drive to avoid traffic or what to wear based on the expected weather or meetings in their day. This means search results are no longer merely taking into account relevance, results are surfaced based on the relevance to an individual shopper. 2. Search is going to be screenless. 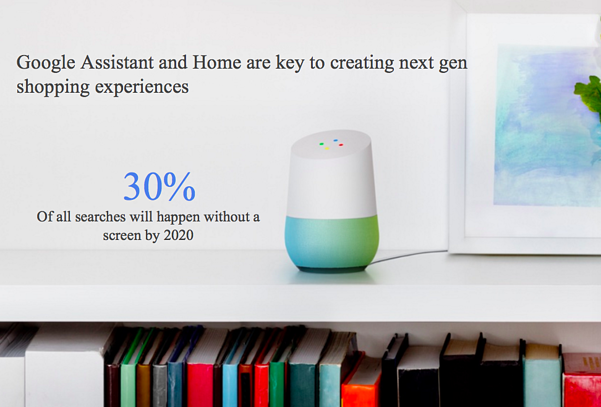 Google research predicts that 30% of all searches will happen without a screen by 2020. In addition, 78% of people said they would like to use a voice-activated assistant to get things done. Adoption of voice-enabled technology, such as Google Home and Amazon’s Alexa, are expected to increase. These tools are expected to change the way a consumer shops. 3. Search-to-Buy journey will be more seamless. In order to support a voice-activated shopping experience, technology will need to make it easy and intuitive for consumers to simply ask for what they want and receive it on their doorstep. Rather than shopping trips or sessions, consumers will be able to purchase something at the moment they need it – going from the initial search to buy in minutes. What does this mean for brands? The time you have to sell your products is shorter and the pressure to be more relevant has increased. Your CPG brand can’t rely on being the one that the most people have heard of, it will need to be the one that a specific shopper is looking for at a specific moment in the context of their day. In addition to increased pressure, you should expect change. These are new technologies. Google is still studying the best practices for submitting product content that has an impact in this AI-powered, voice-enabled, seamless transactional shopping environment. One way to get started, is work with Google Manufacturer Center, a platform that allows brand manufacturers to submit authoritative product data directing to Google. Manufacturer Center provides access to analytics, a better brand experience, and improved performance for brands. Learn more about getting started with Google Manufacturer Center.